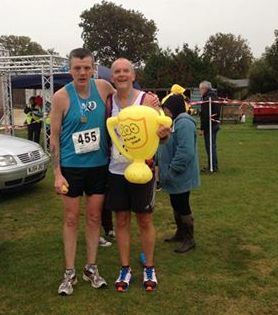 As a club we have the proud honour of recognising Steve Hickman as our sole centurion when it comes to the marathon. A group of A&D runners made it to Steve’s other home for the Isle of Wight marathon last Sunday. Jan, CJ, Dean, Jo, Dawn and Colin supported both Steve and Eddie in their conquering of another gruelling 26 miles! My understanding is that Steve took Eddie in the latter stages of the race to complete his 100th marathon in an impressive time of 4:04:38. Eddie wasn’t far behind in 4:08:09 despite looking like he’d run two marathons (compared to Steve that is)!! Understandably it was an emotional time for all and IOW Runners did Steve proud! Many congratulations Steve on a monumental achievement! Thanks also go to Steve’s support crew who cycled a hilly 16 miles in support of their marathon mentor! A&D we’re proud of you! !